This is the essential set for any poker player. 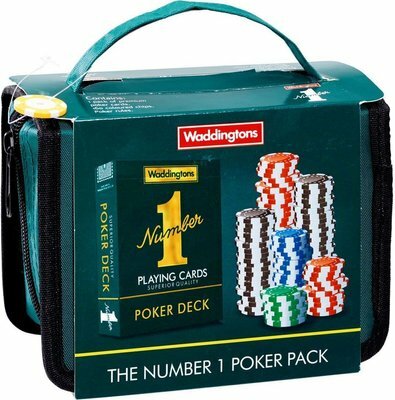 Ideal either at home or on the move, it contains a deck of Number 1's premium poker cards and 160 premium colour coded chips. Poker cards are larger than standard playing cards which are designed for the game of Bridge. With these 63mm x 88mm cards you can capture that Las Vegas feeling, and master the world's favourite card games, such as Texas Hold 'em. With the basic rules of poker also included, everything is comfortably contained in a zip-up travel pouch; perfect for taking a gamble and showing off your poker face wherever you are!